O_O i dont understand it… also FIRST COMMENT YAAAAAAAAAAY! ‘bees communicate by dancing’. he says people can do that too, but obviously he’s been doing all bee-moves, or something. If bees sting a band-aid, what does he put on the wound? Uh oh… given his weakness, I don’t think that relationship would bee a very good idea. 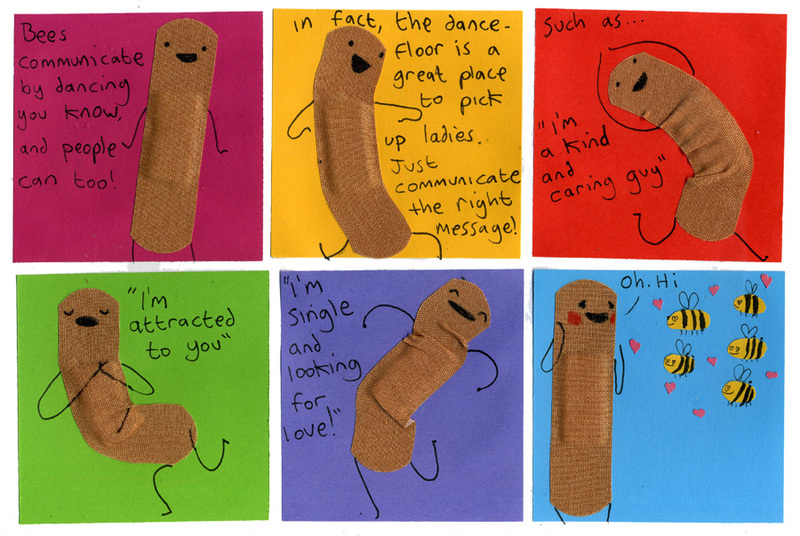 haha dr. bandaid always looking for love but only feeling the sting of rejection… or bees.. Does anyone else notice the mark on the middle of him in the fourth slide? I think that’s just a shadow resulting from the way he’s bending. It’s not a shadow or a mark- it’s just the fold.